Why White in your Kitchen Is Almost Always Right! 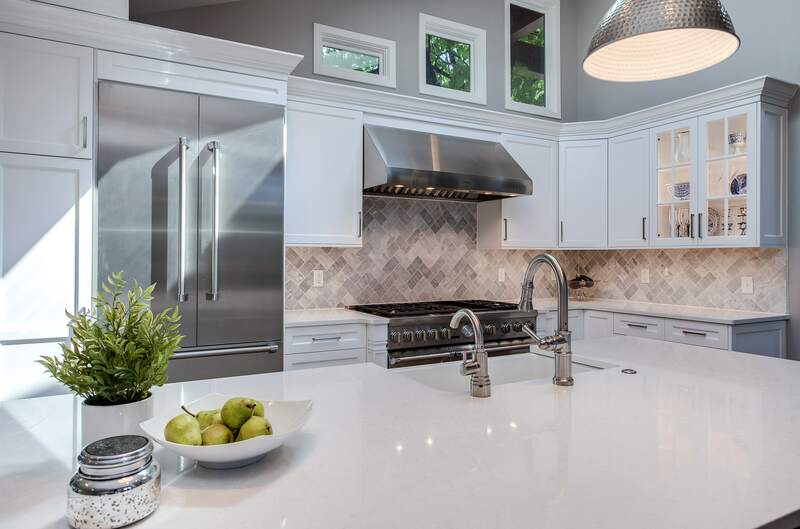 For both cabinets and appliances, white tends to top the preference annually. One of the reasons is that white represents happiness, innocence, and purity according to color therapists. White also has the highest reflectiveness of any color, and that helps make even a small kitchen feel more spacious. 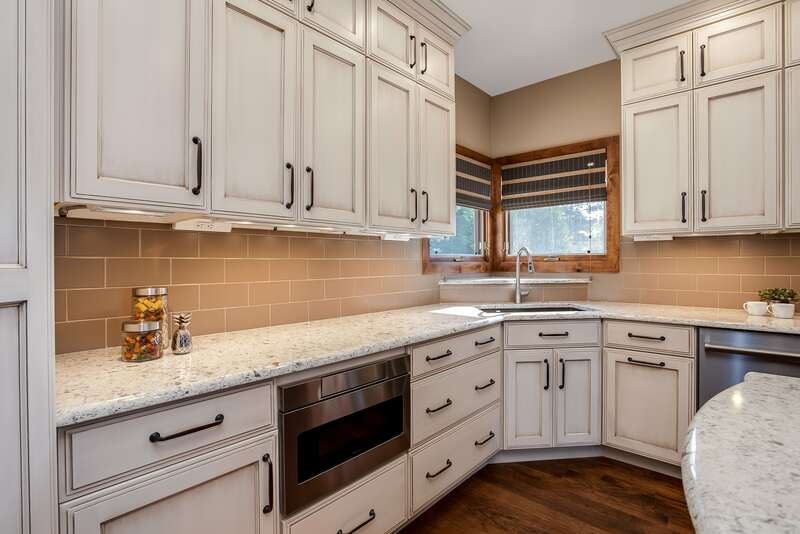 This white cabinetry has a lightly distressed finish completely changing the feel for a less formal look. White kitchens are far from boring. Cabinet doors and trim create shadows and contrast layers that are architecturally interesting and provide depth. It makes every other color in the kitchen pop. White kitchen cabinets are budget friendly. 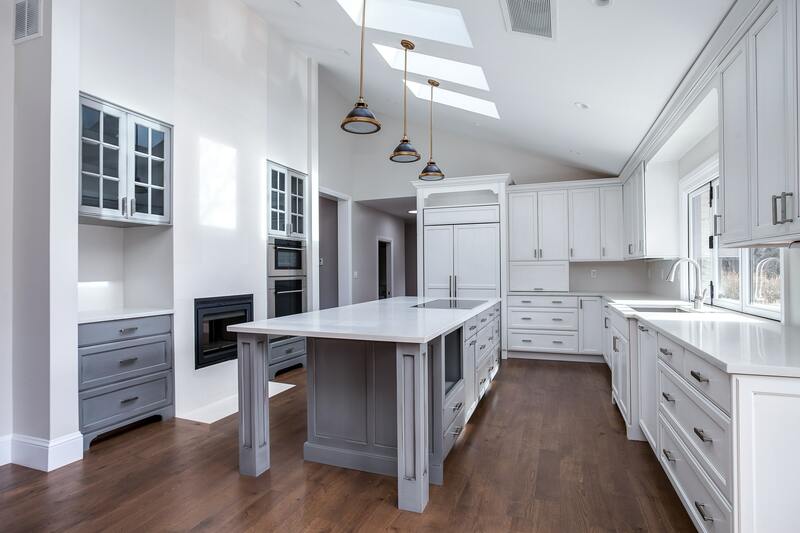 As a standard offering for almost every manufacturer, white cabinets can fit almost any budget and design motif whether you prefer euro contemporary or farmhouse traditional and everything in between. Not everything in your kitchen should be white. We often capitalize on the blank canvas that white provides to incorporate splashes of color for wall and floor coverings and backsplashes. 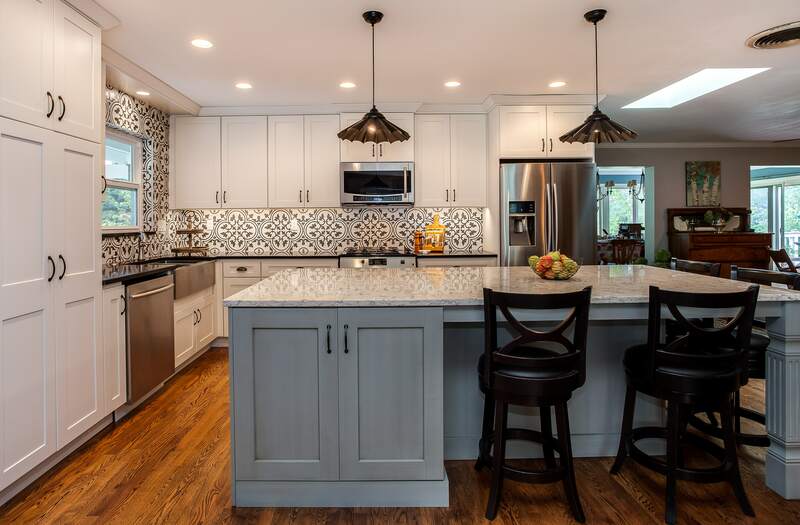 Our clients find that incorporating color into a predominately white kitchen makes distinctive design statements that reflect their personality. Alternatively, white contrasts nicely with stainless steel appliances, wood flooring, and wood countertops. Glass front cabinets with a small section of the kitchen allow homeowners to display their favorite items adding a pop of color to the white kitchen. Another technique to bring warmth to all white kitchens is to incorporate wood elements into the space. 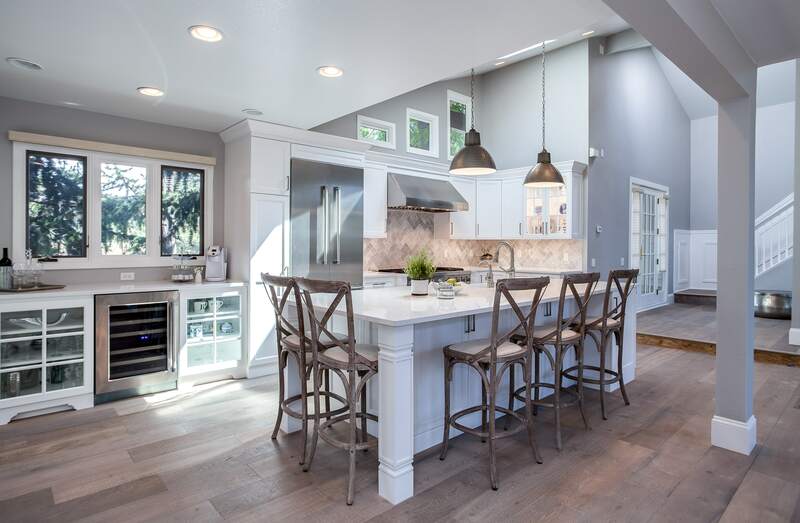 This can be accomplished by specifying light-toned butcher-block countertops or lighter toned wood cutting boards that are both functional and aesthetic. While white kitchens continue to be one the most popular option, two-tone kitchens are trending now too. We’ve designed kitchens with gray upper cabinets and white floor cabinets. The white cabinets served to keep the space light and bright. The look is simply stunning. White appliances are starting to take market share from stainless steel. Manufacturers recognize the timelessness of white and are offering refrigerators, ovens, ranges, dishwashers, microwaves, etc. covered in polished enamel that gives the appearance of white glass. White remains a timely motif for any kitchen renovation. If you would like to see the many shades that white offers for your new kitchen, please visit our showroom or give us a call.